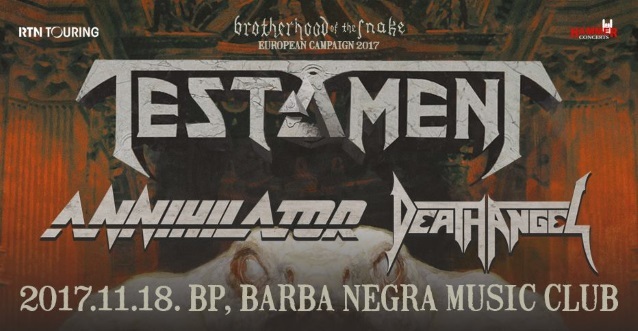 Siniestro "Vinden som piskar ditt ensamma lik"
DEATH ANGEL is currently on the road in Europe with TESTAMENT and ANNIHILATOR. DEATH ANGEL is continuing to tour in support of its latest album, “The Evil Divide”, which entered The Billboard 200 chart at position No. 98 with first-week sales of just over 6,000 units — nearly all from pure album sales. The set followed the No. 72-peaking “The Dream Calls For Blood”, which opened with around 5,400 copies back in 2013. “The Evil Divide” was released in May 2016 via Nuclear Blast. The CD was once again recorded at AudioHammer studios in Sanford, Florida with producer Jason Suecof (TRIVIUM, DEICIDE), who previously worked on 2010’s “Relentless Retribution” and 2013’s “The Dream Calls For Blood”. Mastering duties were handled by Ted Jensen at Sterling Sound in New York City. The cover artwork was created by Bob Tyrrell.